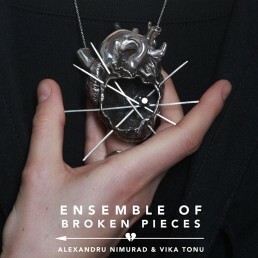 ”Ensemble of Broken Pieces” is another successful collaborative project between Alexandru Nimurad and Vika Tonu, a capsule jewellery collection created by the two artists and integrated in the ”Untamed Skin – The Romanian Blouse” group exhibition, first presented at the International Fashion Showcase, London Fashion Week 2015. 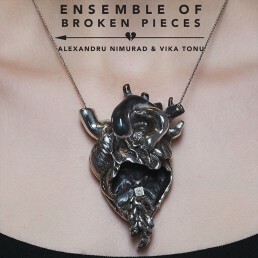 The ”Ensemble of Broken Pieces” series tells the story of a longing, suffering heart, which goes through a painful and complicated process of healing and rejuvenation. 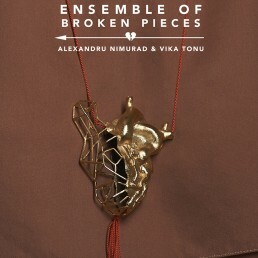 The six precious hearts, handcrafted with anatomical precision, express various stages of this journey – the heart being metaphorically stitched, impaled, hardened, melted and aggrieved. The pieces are plated in silver and gold and adorned with precious and semi precious stones like raw diamond, rubies, corals, zirconia, pyrite. The red silk strings accentuate the intensity of pain and loss. The theme of the group exhibition was the Romanian blouse ”ia” – it`s legacy, importance and modern interpretation. 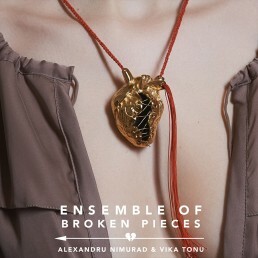 The three designers – Alexandru, Vika and Alexandra Abraham, developed their collective clothing, accessory and jewellery collections around the blouse as an organic structure, honouring its distinctive local background and visual history.Nimurad`s garments interpret the shape and symbolism of the ”ia”, by connecting it to five ancient, ritualistic stages in one`s life. 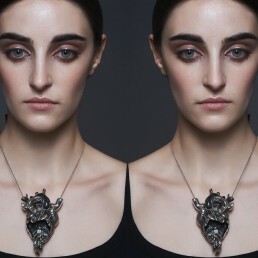 Alexandra Abraham`s s leather harnesses remind about the blouse as a second skin – hand crafted and imbued with motifs and patterns. 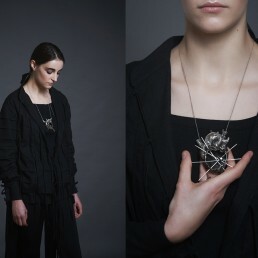 The jewellery series created by Alexandru Nimurad and Vika Tonu was connected to the story of Queen Maria of Romania, a beloved ruler that wore the traditional blouse as a symbol of belonging, and left her heart as a an eternal inheritance for the romanian people. 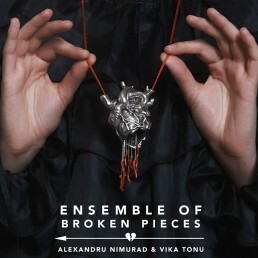 The exhibition was appreciated by the select jury of IFS London and brought the artists three special mentions: ”Best Designer” – Alexandru Nimurad & Vika Tonu, ”Best Exhibition” and ”Best Curator” – Roxana Gibescu. Organized with the support of the Romanian Cultural Institute and Galateca Gallery, the exhibition was further displayed in galleries from Antwerp, Frankfurt and Bucharest. 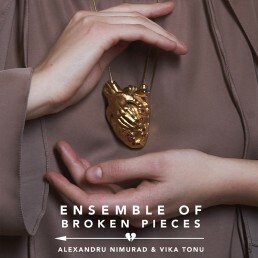 The ”Ensemble of Broken Pieces” collection had the honor to be exhibited at a private, royal ceremony in Pelișor Castle, Romania.